How to Choose a Towing Company ? Although many people are often tempted to choose a towing company based on price, especially during difficult financial times, this is not always the best decision to make and may end up costing more in the long run. If you don’t choose a towing company based on price, then how should you select a towing company? Most importantly, you want to choose a towing company that is reliable and does high quality work. This means finding a company that hires and trains only the best auto mechanics and technicians. Having an inexperienced mechanic working on your car could result in longer repair times, unnecessary costs, or even damage to your vehicle. In addition to investing in its staff, it is also important that a towing and repair company is constantly investing in new equipment. You don’t want a company that works with old or outdated equipment. You want to be sure that the professionals working on your vehicle are using the most modern equipment and tools and that they are properly trained in their use. This results in better and faster service for you. More often than not, when you need towing or roadside assistance, it is in a state of emergency. It is certainly not something that was planned and you cannot predict when it will occur. 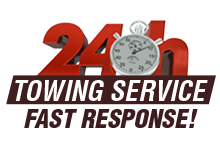 Therefore, you need a towing company that not only operates 24 hours a day, 365 days a year, but also has the resources to guarantee that they will arrive quickly to help you. Finally, be sure to consider customer service, honesty, and integrity. As mentioned above, you usually deal with towing companies in emergency situations – or at least high stress situations. At times like that, a friendly and helpful customer service representative is critical to helping you remain calm. You also want to deal with a company that has earned a reputation for honesty and fair prices and not a company that is going to take advantage of you in your “no choice” situation. Green Towing San Diego is an established towing and emergency road service company, based in San Diego, California. Our customer service and repair professionals have earned a reputation for quick response times, high-quality work, and fair prices.